Vyomax® KreAlkalyn® is a performance enhancing supplement designed for all athletes including boxers, runners, wrestlers, weightlifters, cyclists, rugby and football players. Kre-Alkalyn® is an ideal supplement for female athletes in all sports. No loading is required. Training Days: Take 2-4 capsules with a large glass of water, 90 minutes before a workout. For rapid recovery after a workout, take 1-2 capsules with water, to help avoid lactic acid build up, improve recovery time and increase lean muscle mass. Non-Training Days: Take 1-2 capsules with a large glass of water in the morning. This product is not recommended for persons under the age of 18 years, do not take if pregnant or breastfeeding. Keep out of the reach of children. This product is a food supplement and should be used in conjunction with food as part of a healthy, balanced and varied diet & lifestyle. Vyomax® Deluxe Protein Powder is a high quality balanced blend of proteins, developed for bodybuilders and athletes who want to build quality lean muscle whilst maintaining a low carbohydrate, low fat diet. Vyomax® BCAA Plus Formula is an excellent nutritional supplement designed to encourage muscle growth (anabolic) and prevent muscle breakdown (anti-catabolic). When we exercise we oxidise BCAA's (Branched Chain Amino Acids), if these are not replaced we can damage our muscle tissue and slow down our recovery time. 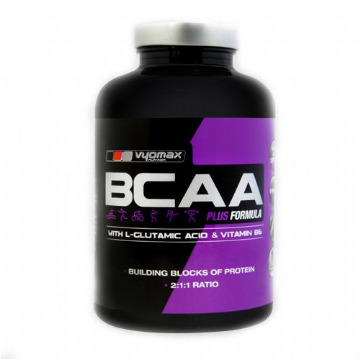 BCAA's are therefore essential to promote a faster recovery and better muscular gains.